Intense moments of an official Oklahoma City Thunder game call for the right blankets and bedding fan gear merchandise to enjoy in your zone. whether your looking to add a personal team touch to your living room or a comfortable warm inviting Oklahoma City Thunder look to your bedroom, we got you covered. 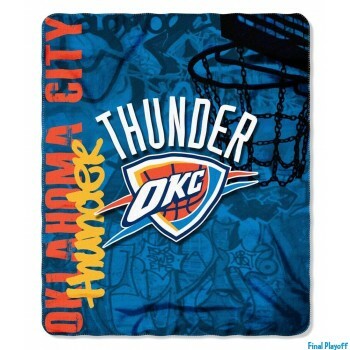 Official Oklahoma City Thunder fleece blankets, snuggie or throw options will definitely transform your living space. Great gift ideas also for that Oklahoma City Thunder fan to decorate any bed or sofa with Oklahoma City Thunder pillow cases, sheets or comforters that scream team spirit. All Oklahoma City Thunder orders are processed and marked for shipping same business day Monday through Friday 9:00am to 6:00pm pacific time excluding holidays and weekends. Rest assured knowing that your sports team merchandise is packed and shipped in house for an error free delivery. Check out other fabulous items in our catalog and bookmark our site for a future return on updated new arrivals.